The International Archean Symposia in Perth, Three Decades on: a Review by Dr Alec Trendall | Geoconferences (WA) Inc.
An account of the Fourth International Archean Symposium (4IAS), which took place in Perth in September 2001, has already appeared in TAG (Dunphy & Wyche, 2001). At that meeting I agreed to act as a coordinator for the preparation of a more extensive general article covering all four symposia, by a “veterans’ group” (VG) of registrants who had attended all of these decennial Perth events. My agreement was based on a belief that there might be worthwhile lessons to be learned from reflection on the four meetings, not only concerning the progress of Archean geology, but also in respect to changes in the balance of international attendance and interest through the years. However, two things soon became clear: first that very few of the VG had the time to contribute, and second that records of the earlier meetings were surprisingly hard to find. As a result, the original concept for the article is no longer appropriate, and I offer here instead an informal account, especially for a younger generation of GSA members, of the origin and organisational evolution of the meetings; also included are some personal thoughts on the progress of Archean geology as reflected in the successive symposia, as well as on their possible future. These symposia originated within the Western Australian Division of the Society. At a committee meeting in the mid-1960s a proposal was received that the Division should sponsor a major international conference on carbonate sedimentation. The committee enthusiastically accepted the idea in principle, but asked the proponent to prepare a more detailed plan. Alas, at the next meeting, instead of the anticipated plan, news came that the idea had been abandoned. A member of the Divisional Committee, Joe McCall, wondered aloud whether a practical alternative topic could not be found in the geology of the Archean rocks, as these were then the subject of much primary mapping, research, and exploration in Western Australia. Agreement was quickly reached that an Archean Symposium should be organised for 1970, designed to attract at least some international attendance. Joe McCall became Chair of the Organising Committee. By any standards the 1970 meeting was a resounding success. The Western Australian “nickel boom”, although past its peak, was still very much alive, and Archean rocks, especially ultramafic ones, were a hot topic: exploration managers had only to see the word “komatiite” on a conference program for generous support for staff attendance to be assured. When registration numbers topped 500 a few weeks before the event emergency plans had to be made to move the opening ceremony and plenary sessions from the University of Western Australia to a local cinema; the final registration figure was 614*. This was, at the time, the largest geoscientific meeting ever to have been held in the southern hemisphere, let alone Australia, a fact which helped to destroy a belief then held by many on the eastern seaboard that it would be imprudent to entrust the organisation of events more serious than a two-up game to Western Australia; coincidentally, Western Australia had been designated as the next State to host the GSA executive, and this helped to obtain federal GSA sponsorship, and financial underwriting, for the symposium. 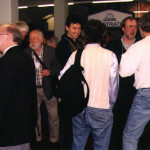 There was significant international attendance, and a well-structured scientific program ensured that every registrant went home with a good knowledge of the global state of play in Archean geology; they also retained a sense that here was a cutting-edge area of geoscience, inhabited by lively people with exciting ideas. The field trips to Kalgoorlie and Norseman were a particular hit. A key to the success of the meeting, apart from the fact that the topic was right for the time and place, was the fact that strong support came from all geological organisations (academic, government and industry) within the state. This wide enthusiasm for the concept resulted in an abundance of volunteer helpers whose efforts were put to good use within an effective committee structure. The prudent financial management of the Administration Subcommittee Chair (Joe Lord) led to a significant profit, which the GSA Council agreed would be available as seed funding for possible future meetings in Western Australia. Following the 1970 symposium the organisational energy of geoscientists throughout Australia was devoted to preparation for the 1976 International Geological Congress, held in Sydney with excursions in all states and territories. But even before this was over Joe Lord, who was then Director of the Geological Survey of Western Australia, had canvassed the possibility of running a follow-up IAS in Perth, and a an organising committee, with Peter Harris as Chair, was set up. 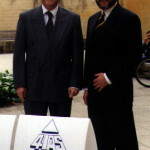 The Second IAS, sponsored jointly by the GSA and IGCP, and held at the University of Western Australia in May 1980, was run on closely similar lines to the first, and the 10-year interval proved to be an appropriate one to attract many new names to present new work; most gratifyingly, a whole generation of younger geologists were keen to take partin the excursions, which were more extensive than those of the first meeting. There were 384* registrants, from 13 countries, and while the meeting did not quite achieve the sustained excitement of 1970 it was an undoubted scientific success, and a highlight was the report of the discoveries at North Pole in the Pilbara. Once again, there was a financial profit flowing back to the GSA. During the early 1980s many geologists in Western Australia, and particularly those who had been closely involved with the first two IASs, felt that the profits from them, which were achieved as a result of the efforts of many dedicated volunteers, should remain within Western Australia; this was despite the cooperative attitude of federal GSA Councils, which had no difficulty in recognising the local efforts, and returning funds when needed. But the felt need for greater financial autonomy led to the establishment in 1988 of a new organisation called “Geoconferences (WA) Inc.” (Geoconferences hereinafter), essentially for the purpose of sponsoring the Third IAS, and setting up its Organising Commitee (with David Groves as Chair). Geoconferences acted as a financial guarantor, and Joe Lord was its founding Chair. It is important to emphasize that Geoconferences saw itself not as a rival, but as a partner, of the GSA, which was a willing co-sponsor of the meeting. The attendance of 402* registrants at 3IAS in 1990, of which a third came from 25 countries outside Australia, showed that the 10-year interval was seen both within Australia and internationally as appropriate. Its success established the continuing role of Geoconferences (WA) Inc. in Australian geoscience, and by the late 1990s it was clear that a fourth meeting in 2000 should be convened. In the event, this was postponed until 2001 because of a clash with the 2000 IGC in Brazil, but its once again larger registration, of 423*, maintained the roughly one third proportion of overseas attendance. Details of the highly successful 4IAS, are given by Dunphy & Wyche (2000); the Chair, Mark Barley, had to cope with immense difficulties caused jointly by the events of September 11th in the USA and by the collapse of Ansett Airlines. A reasoned analysis of the progress of Archean geology as recorded in the papers published in the volumes resulting from earlier IASs (Glover, 1971 for 1970; Glover & Groves, 1981 for 1980; Glover & Ho, 1992 for 1990), and from the Abstracts for the 4IAS, is quite beyond the scope of this review; the following comments are brief, selective and simplified impressions. The 53 papers in Glover (1971), presented either in complete or abstract form, are mainly focussed on Australia, and within that focus concentrate on matters relevant to the nickel boom – serpentinites and economic geology. There are few papers on broad general problems of Archean geology, and none concerned with many significant areas of Archean rocks: for example Greenland-Labrador, the Amazon Craton, north China, Fennoscandia-Karelia, Aldan, Zimbabwe, and India. The 42 papers in the volume from the Second IAS (Glover & Groves, 1981) go some way to redress this imbalance by including a much wider range of contributions on the regional geology of Archean cratons outside Australia; but the first paper, a review by Joe McCall of progress since 1970, identifies no quantum leap forward. Most papers are still, as in the earlier volume, presented under compartmentalised headings, reflecting the concentration by authors either on tectonics, or geochemistry, or geochronology, or sedimentology, and so on: only a few approach general Archean problems holistically. Many of the 32 papers in the 1990 volume (Glover & Ho, 1992) do begin to take a broader view, and this is reflected in their more general classification under the headings “Terrains”, “Processes” and “Metallogeny”. The Abstract Volume of the 4IAS still reveals no massive advance in understanding of the early Earth, although the approach in many areas has obviously been refined since 1970. To me the greatest single advance in Archean geology revealed by a comparison of 1970 and 2001 is in the confidence of time calibration. In 1970 the geochronological focus was on Rb-Sr isochrons. These were still relevant in 1980, but Sm-Nd was being looked at as a recent advance; and by 1990, early SHRIMP zircon U-Pb results were being reported. Today, in 2001, single-crystal zircon geochronology, for which the Australian-conceived and manufactured SHRIMP is currently the most effective tool, is the “industry standard” for time-calibration of all Archean events and processes – whether sedimentation, volcanism, magmatism, tectonism, or metallogeny. Papers on all these topics which lack reference to a good time framework are properly seen as incomplete; and it is particularly the case that palaeomagnetic work not complemented by reliable chronological control is now of little interest. SHRIMP zircon geochronology has also provided the key for pushing the geological record back beyond the 4 Ga barrier. Next to improved time calibration, in my personal view, comes our changed view of the status of life in the Archean. A single relevant paper in Glover (1971) includes the words “The composition of carbonaceous matter in Precambrian rocks, and especially in the Archean, does not appear to have been investigated…”. By contrast, a number of contributions at the 4IAS reflected the enormous current international interest in the abundance of chemical, isotopic, and palaeontological evidence that is pushing our knowledge of life back almost as far as the earliest geological record, and even possibly to Mars. As well as advances in science per se, there have also been dramatic changes between 1970 and 2001 in the ways in which information is processed and presented. Use of the OHP to show crudely hand-drawn maps, or unreadable columns of chemical analyses, has now given way to software packages that display terabytes of digital data in 3-D images that expand, contract, invert and rotate in synchrony with the speaker’s words. There is not necessarily, however, a 1:1 correlation between the spectacular quality of such presentations and their scientific content; it is also easy to include much more data on these sophisticated images than audiences new to a topic can grasp. Over the years a good balance between posters and oral presentations has been reached, with no posters in 1970, and many excellent posters in 2001, all of them displayed throughout the meeting in an ideal venue. But despite undoubted progress in both science and its presentation, the evidence from the IASs is that advances in Archean geology since 1970 have been slow and steady. There have been no quantum leaps in understanding of the Archean Earth comparable to the breakthrough in understanding of how the modern Earth works represented by the appearance of the plate tectonics paradigm in the 1960s; and in that context an early enthusiasm to transplant that paradigm to the Archean Earth seems to have lost most of its steam. Arthur Holmes wrote, in 1944, “The origin of the continents remains an unsolved geological problem.” (Holmes, 1944, p.21). Those words were just as true in 2001 as they were in 1944; little of all the material presented at the four IASs has addressed that essentially Archean problem, and none has supplied a totally compelling answer. Another feature of regret to me is the general disinterest of Archean geologists in the gap (around 4 Ga) between the point where the modelling of planetological theoreticians ends and geology starts. This disinterest exists on both sides of the gap, and it is relevant to note that an approach by 3IAS to the Meteoritical Society, which also met in Perth in 1990, to join in a combined session on the early Earth, was rejected by the MS.
Innumerable periodic international conferences on a vast range of specialised areas of geoscience are now held globally; and many tend to mimic, on a much smaller scale, the well established International Geological Congresses, which follow the same 4-yearly cycle as the Olympic Games. Like the Olympics, the IGCs are bid for by different countries within a formalised committee system – in this case the International Union of Geological Sciences; and like the Olympics they move from country to country, bringing dollars and identifying heroes. The International Archean Symposia are unusual in geoscientific events, both in their 10-yearly repeat period and in that they essentially “belong” to Perth, in much the same way that some believe the Olympics should belong to Athens. The attendance figures indicate that over 30 years the Perth IASs have proved themselves as decennial meetings at which geoscientists interested in the Archean can compare notes and review progress in a pleasantly relaxed environment. Equally importantly, they can also share a variety of excursions to some of the world’s most extensive, more accessible, better known, and reasonably well exposed Archean rocks My personal belief is that it would be strongly in the best interests of Australian and international geoscience for the tradition now successfully established by the Perth International Archean Symposia to be maintained in the long term. I also favour their continuing focus on the Archean, rather than by diluting them by inclusion of the Proterozoic. In 1970 the definition and significance of the Archean-Proterozoic boundary was still a hot topic of debate. Now the boundary is, by administrative concensus, arbitrarily fixed at 2.5 Ga, although what this time-line signifies in terms of Earth’s evolution remains unclear. Whatever the answer to that, the history of the Earth before that time seems to me to provide a coherent package of problems well suited to these dedicated Archean Symposia. If the 5IAS and successors take place in Perth in 2010 and onwards, as I personally hope, one important item on my wish list for them would be that ways could be found for them to act as a catalyst for bringing knowledge of lesser-studied cratons (some already mentioned above) up to speed with those better understood. Good attendances, and fine papers, at all four symposia have come from Canada and South Africa, and it would be wonderful to have contributions of the same strength or even stronger from, for example, other African countries, India, Brazil, China, and Russia, which have important areas of Archean rocks. I am particularly grateful to Joe McCall for correcting some errors in my first draft, and to Sue Ho, Ken McQueen and Ian Williams for supplying some archival material. Dunphy, J. 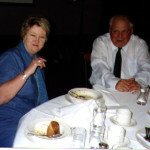 & Wyche, S. (on behalf of the 4IAS Committee), 2001, 4th International Archean Symposium, The Australian Geologist, No.121, pp. 14-15. Glover, J.E. (Ed. ), 1971, Symposium on Archean Rocks, Geol. Soc. Australia, Special Publication No.3, 469 pp. Glover, J.E. and Groves, D.I. (Eds. ), 1981, Archean Geology: Second International Symposium, Perth, 1980. Geol. Soc. Australia, Special Publication No.7, 215 pp. Glover, J.E. and Ho, S.E. (Eds. ), 1992, The Archean: terrains, processes and metallogeny. University of Western Australia (Geology Department & University Extension), Publication No.22. Holmes, A., 1944, Principles of Physical Geology, Thomas Nelson & Sons Ltd, London & Edinburgh.